My grandparents are easy: my father’s parents (and stepmother) are buried at Hamilton Cemetery in Massachusetts, while my mother’s parents (and stepmother) are buried at Arlington National Cemetery in Virginia. I was present for my paternal grandfather’s memorial service in 1991, my maternal grandfather’s burial in 1994, and for my paternal step-grandmother’s memorial service in 1996. The further back one goes, the more complex the landscape becomes. My Steward great-grandparents were buried in the family burial ground in Goshen, New York, but when the family property there was sold – as recounted in Aunt Margaret’s notes – their remains were moved to Slate Hill Cemetery, also in Goshen. My Ayer great-grandparents are buried in separate places; it’s hard to know whether that reflects a cleavage in the relationship or just my great-grandfather’s desire to be buried with his father and mother. 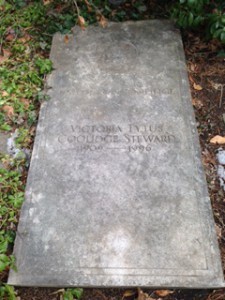 In any case, my great-grandfather Ayer is buried in the family plot at Lowell Cemetery in Lowell, Massachusetts; his first wife is buried near my grandparents at Hamilton Cemetery; and his second wife – who outlived him by 43 years – lies with her family at Mount Auburn Cemetery in Cambridge, Massachusetts. My Bell great-grandparents are buried at Forest Lawn Cemetery in Norfolk, Virginia; again, though, my maternal grandfather’s parents were buried in the same plot, while his stepmother lies elsewhere, near her mother and brother. 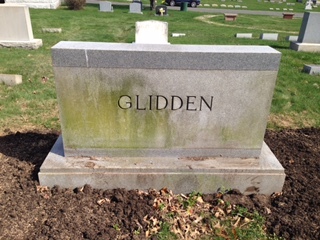 On the other hand, my estranged (perhaps even divorced) Glidden great-grandparents are buried together at Druid Ridge Cemetery in Pikesville, outside Baltimore; their daughter Miriam is there with them, while her husband is buried elsewhere with his family. As Chris found, with great-great-grandparents the distances (and the absence of documentation) can prove troublesome. I assume the Stewards were moved to Slate Hill; the Beeckmans are buried with their son and daughter-in-law at Sleepy Hollow Cemetery in Sleepy Hollow (Tarrytown), New York. The Ayers – my great-great-grandfather, his two wives, one son (my great-grandfather), daughter, and son-in-law – lie in Lowell Cemetery. The Ilsleys are at Mount Pleasant Cemetery in Newark, New Jersey, as are their two sons. My Bell great-great-grandparents, who died in Norfolk, are buried near my great-great-grandmother’s family at Hollywood Cemetery in Richmond, Virginia. My rascal great-great-grandfather O. D. Jackson (1848–1915) lies at Forest Lawn Cemetery near his daughter (my great-grandmother), while I cannot find his widow – who moved to Phoenix and then Long Beach, surviving the great earthquake of 1933 and dying (as Jennie Waterman) in 1937 – in a California cemetery. My Glidden great-great-grandparents are buried at Lake View Cemetery in Cleveland, while my Boucher great-great-grandparents are to be found in a handsome plot at New Cathedral Cemetery in Baltimore County along with my matrilineal great-great-great-grandmother, Mary Josephine Eliza (McNulty) Malloy (1825?–1891). Enjoyed your article Scott. During the past fifteen years I have been gathering pictures of ancestral gravestones and grave sites. They are all kept in a separate album with a copy of the inscription, direct line from them to my children, and description of the location. Those pictures also get added to biographical sketches as they are written. Findagrave.com has been extremely helpful with many cemeteries and stones that I have not visited. Just one more interesting puzzle in genealogical study. My maternal grandparents and his parents plus all children except one are buried at Forest Hills in Boston. The one plus other family members are buried at Mt. Auburn in Cambridge. Have you seen the memorial at Mt. Auburn for “William” an immigrant which lists his four degrees and the universities that gave them and for “June” that has the words “Beautiful,” “Artistic” and “Rockette” below. After all the paper research Scott, I too enjoy locating and visiting the graves. What I find moving is not the memorial and the information it contains, but the knowledge that on a day long ago when the burial took place, everyone surviving in the family at that time probably stood in the same place where I now am standing. “…on a day long ago when the burial took place, everyone surviving in the family at that time probably stood in the same place where I now am standing.” YES! It is the final page in our ancestor’s story. It is a physical site we can show the kids and not just dry facts on paper. But it drives me nuts when I know someone died in a certain area – and cannot locate the grave. Missing ancestors. For your lost California grave site – California death certificates include a location for burial or cremation — get the death certificate and it should send you to her grave. Thanks, Michael, that’s great advice. I see that she died in Los Angeles County on 5 September 1937; it look like the California Death Index has a state file number for her case of 57982 — where might I find the death certificate itself? I noticed the Glidden headstone. Do you have a collateral line to Amy Glidden? She was a close friend of my Great-Great Aunt, Louise M.E. Smith, of Abington, MA. Aunt Louie, as she was known to me, was a schoolteacher for 50 years, never married, & had a close group of friends. I have photos of Amy Glidden, & many mentions of her wirhin family diaries. I am just checking, in case I can be of any assistance to you. Ellen, thanks for checking! My Gliddens were in Newcastle, Maine; Cleveland, Ohio; and Baltimore, Maryland. Amy Glidden does not ring a bell, and I have a fair amount of information on the family of my great-great-great-great-grandparents, Joseph and Mary (Waters) Glidden.